We hope you are now inspired to plan and take a boat trip this summer – either in South Puget Sound, to the San Juan Islands, the Canadian Gulf Islands or beyond. One important tool you want to bring along is a good understanding of the Marine Rules of the Road. With no lane markers or traffic signals on the water an entirely different set of rules to avoid collisions is needed. This includes which vessels have priority, which vessel must give way in collision scenarios and what waters are unsafe for travel. The rules also incorporate sound signals, like your obligations while traveling in fog, and the Canada cardinal buoyage system. Lighting requirements for different vessel types also come into play for boating at night. This Tech Talk will review these rules and how they apply to a rather surprising collision between the private pleasure vessel Nap Tyme and Washington State Ferry Chetzemoka. Come see the collision video and hear who the US Coast Guard found at fault, and why. 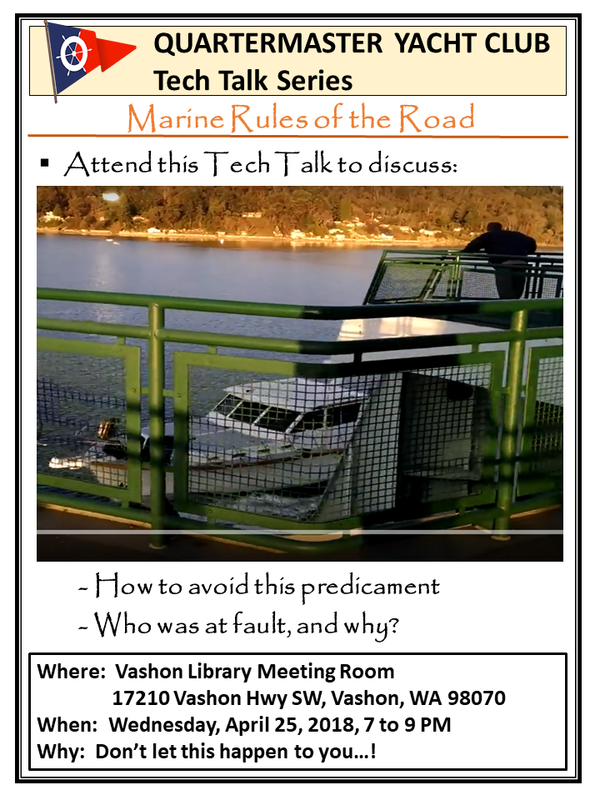 Be prepared to share your own rules of the road stories, and we know you have them, at this Tech Talk on Wednesday, April 25 at 7PM in the Vashon Library meeting room.